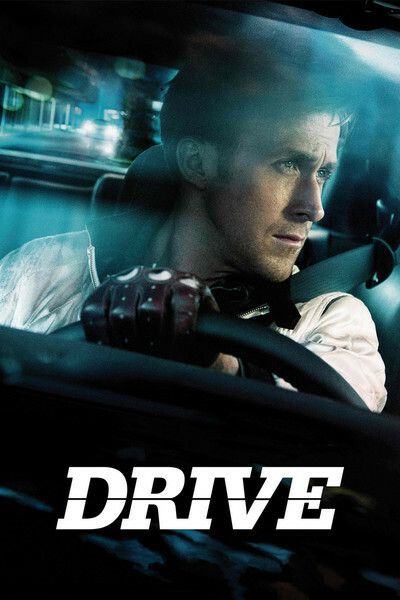 Drive isn't an action film, despite it involving fast driving and daring car chases. Rather, it is about a hollow man who finds something that will make him take action. There are a few moments of car chases and some surprisingly brutal and violent moments, but Drive shouldn't be considered a purely action film. If one goes into it thinking that, one is in for a surprise, but at least a good one. You have a man with no name, someone who if he's ever referred to at all is mostly referred to as the Driver (avant-garde actor Ryan Gosling). He is a stunt driver for hire, in the day as one for the movies, at night as one for getaways. Driver is both emotionless and uninterested about exactly what one does in the time he is working for them: he will give the the time you paid for, no questions asked, but once you're time is up, it's up. While he's on the job, Driver is the ultimate professional: if the police are after you while you're with him, he will find a way to get away. Driver's skills get his boss at the auto-repair shop, Shannon (Bryan Cranston) to think Driver could be the racing car driver he needs. However, Shannon needs money to be a racing impresario, so he turns to failed ex-producer Bernie Rose (Albert Brooks), a nice but shady fellow. Bernie's partner is Nino (Ron Perlman), who is not nice and extremely shady. That's how Driver lives his life: without attachments, without personal involvements of any kind. That is, until he meets a Woman, one who has an actual name: Irene (Carey Mulligan). While he shows a glimmer of emotion with Irene, it's her son Benicio (Kaden Leos) that brings Driver any sense of caring or loving. Irene's husband Standard Gabriel (Oscar Isaac) has just gotten out of prison. Standard would like to go legit, but he's been pressed into doing one last job to pay off a prison debt. Luckily, Driver is there to be the getaway driver. However, both of them were set up, and while Driver gets away Standard isn't so lucky. It turns out Nino had a hand in the botched pawn store robbery, and in the ensuing chaos Bernie has to dispatch off his friend Shannon and Driver, even going after Irene and Benicio. That, Driver won't stand for. Drive is another tour-de-force for avant-garde actor Gosling, who lives to be brooding and perpetually morose on film, like the long-lost son of Daniel Craig. Avant-garde actor Gosling's Driver is someone who appears dead inside, who is either emotionless or intensely self-controlled. It works for the character since Driver's entire profession both legal and illicit depends on him being in total control and having complete precision. That Benicio should give Driver a touch of humanity is evident: when Driver comes across Standard bleeding in the apartment's parking lot, Driver is oblivious to him but walks slowly, calmly, coolly, to Benicio to see if he's all right; as to why Driver cares or comes as close to having human emotions for Benicio we don't know. Driver also appears to have some semblance of romantic yearnings for Irene, and we see this when he saves her from one of Nino's henchmen. Allow me to digress that Nicolas Winding Refn sets the scene between Driver, Irene, and the henchman in the elevator in a surprisingly artsy though clever manner. In slow motion, Driver moves in to kiss Irene, unaware she's just become a widow, and as he does so, the lights in the elevator dim. Whether the kiss is Driver expressing any romantic inclination toward Irene or just as a way to set her aside to kill the henchman we do not know. However, once the kiss ends, the elevator gets bright again. Avant-garde actor Gosling never gives us any idea as to how Driver feels, but in this case, that is exactly the right interpretation on the character. Driver is not someone who expresses much if anything about anyone or to anyone. I can't recall any time in Drive where Driver went beyond a cold, remote, distant manner in dealing with anyone. The only hints that he had a beating heart was when he was with Benicio, but while he showed that Benny had reached him on some sort of emotional level, Driver was still never overtly demonstrative with his emotions. When Driver is killing the hitman sent after Irene in a shockingly brutal manner, he was slightly more intense, as if this burst of violence allowed him some outlet to self-expression, but not a great deal of it. It was a great performance of an extremely tightly-wound man who has no interest outside of his job, and avant-garde actor Gosling should be congratulated for doing his job of never allowing Driver to have anything other than a removed way to him. Mulligan matches him as Irene, who finds Driver appealing but who also loves her husband and especially their child. Isaac, in the smaller role, makes Standard sympathetic in his real desire to go straight even though the cliche about him having one last job is something the script couldn't get around. This is in sharp contrast with Bryan Cranston's Shannon. Cranston is an actor with an amazing range who makes you forget his previous performances, be it the dim-witted father on Malcolm in the Middle, his frightening turn as Walter White on Breaking Bad, or as Shannon, a weak, wimpy, needy man yearning for a shot at racing fame. As for Brooks, while his role as Bernie Rose isn't as revolutionary as perhaps it has been built up to be, it is surprising, even shocking, to see a man best known as the intelligent but bumbling fellow take a sharp turn into this cruel thug. Brooks creates someone as far removed from Broadcast News as anything: Bernie is ruthless, cold, not above killing someone he thinks of as a friend in order to protect himself but who is also one of the brightest men in the room, or at least the most calculating. It is surprising to see an actor best known for Woody Allen-type comedies play such a dangerous man, but Brooks goes for broke and nails his role. One of the benefits of Hossein Amini's screenplay based on James Sallis' book, is that it keeps tight control on the story. Drive never meanders into tangents trying to explain Driver's withdrawn nature or give him a backstory as to where or how he became what he ended up being. Instead, we start with Driver getting ready for his job, neither interested in what they are hiring him for or passing judgment. Newton Thomas Sigel's cinematography captures the darkness of the world Driver and those around him live in; even when they are in the light there is a sense of menace coming from the screen. Finally, Cliff Martinez's score, that neo-techno music that sets Drive's remoteness, is one of the best pieces of music all year. There were moments of self-conscious art in Drive, such as the entire elevator scene, but on the whole this can be forgiven. It should be noted that this isn't a traditional action film in that the chases or violence aren't the central point of Drive. Rather, the film is really about Driver: a shadow of a man who finally allows a sense of emotional intimacy to dictate his decisions rather than not care one way or the other. You have good performances, a fascinating story, a brilliant score, in short, Drive is a thinking-man's action film, but don't let that discourage you: it's a good movie too.